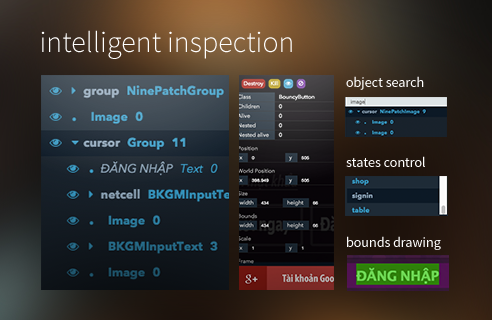 [UPDATE] Phaser Inspector Plugin would be redesign and restructure soon to reborn as a better plugin. 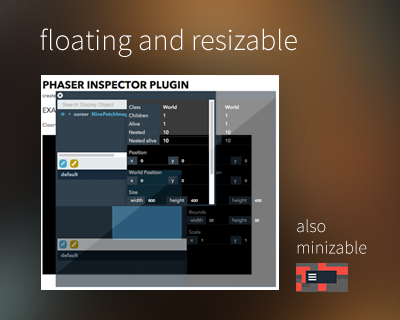 [UPDATE] Phaser Inspector Plugin now support RenderTexture on WebGL. Phaser Inspector Plugin allows you to inspect your (or someone else) Phaser game. The plugin is written using Angular.js and ES6, compiled with Babel and Browserify, tested on Phaser 2.1.3 and Phaser 2.4.3 running on Google Chrome Version 45.0.2454.85 (64-bit) on OSX Yosemite. Display object name guessing (by looking for this./name/ in parents). Text as name for Phaser.Text. Display objects non-case-sensitive search by name and class. Feel free to follow me on twitter @netcell and check out my blog! Check the example folder (please run bower install before that, and serve the folder on a server/localhost) or try that example rightaway on this codepen. NOTE: I have only tested this plugin on Google Chrome so I am not sure how this would perform on other browsers. Also since this plugin is for debugging your game, you should not expect to use it on your mobile devices, meaning remove it (or conditionally not loading it) when deploying to mobile devices. This content is released under the (http://opensource.org/licenses/MIT) MIT License. Phaser Inspector is maintained by netcell. This page was generated by GitHub Pages using the Cayman theme by Jason Long.